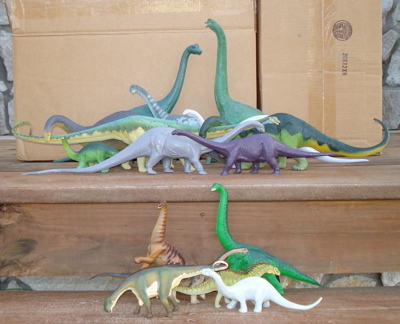 Sauropods are the most recognizable Dinosaur toys. and young. These herds would have been great regardless of the numbers given the size of the individuals alone. Remember, these gave birth through laying eggs, but could not wait around for the eggs to hatch as they would have simply denuded the area. Hence they were in constant migration mode. When the eggs did hatch, the chicks(?) would have to fend for themselves until they could find a herd to join. This would assure diversity in their DNA and keep the breed strong. 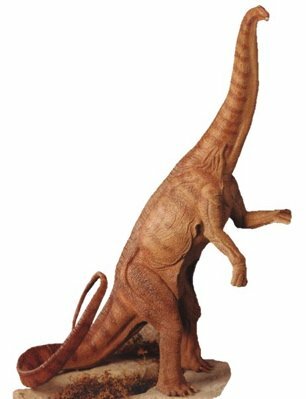 The earliest Sauropod "Dinosaur toys" were from SRG and were sold in museum gift shops. These were a solid base metal with a patina of bronze and came in two sizes, large (~9", 23cm) and small (~4.5", 11.5cm). 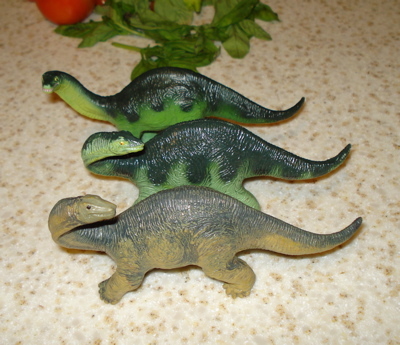 These "Brontosaurus", had very little detail and were quite fragile when risked in play. 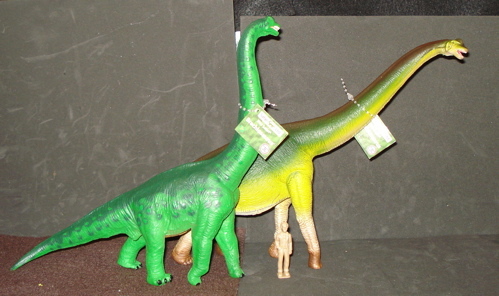 Then, in 1955, the Marx Brontosaurus appeared and led a revolution in Dinosaur toys. 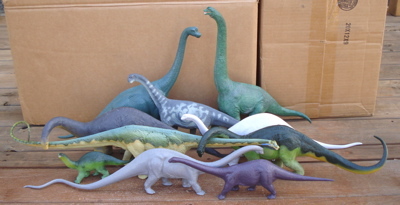 The Marx Brontosaurus was the only member of the Sauropod family available to youthful Dinosaur collectors (MPC (Multiple Plastics Corporation) DID offer their own "competitive" line up in the 1960s- I disparage it.) 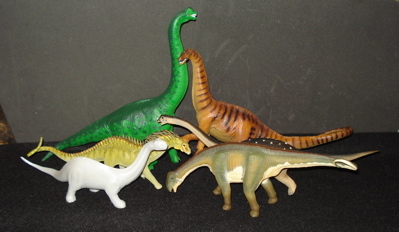 until 1974 when Invicta introduced their British Museum (of Natural History) Dinosaur toys series with the Diplodocus. This was the first of five Sauropods that included Mamenchisaurus (1980), Brachiosaurus (1984), Cetiosaurus (1985) and ended with the Apatosaurus (1987). 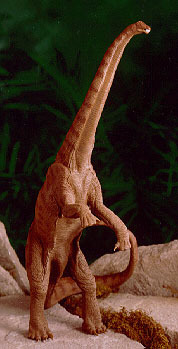 1988 saw an entirely new member of the Dinosaur toys Sauropods clan. The Carnegie Museum Collection Apatosaurus was a comparatively huge, new Dinosaur toy, presented in a brightly painted package; which marked the evolution from monochrome to natural (and not so natural) colors in Dinosaur toys. 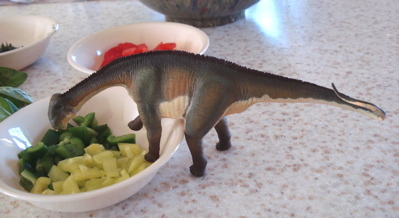 There was still one thing missing from Dinosaur toys and the Sauropods embodied it. That thing was "action." 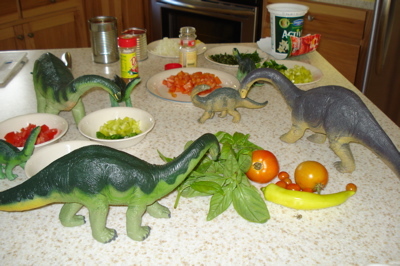 The Dinosaur toys, up to this point had been largely static in their sculpture. 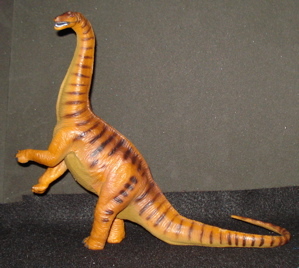 Battat, in conjunction with The Boston Museum of Natural History (it seems like every company had its own museum certifying its Dinosaur toys as true-to-extinct) came out in 1994 with their own line of Dinosaur figures. They are since out-of-production and among the most valued of Dinosaur toys. 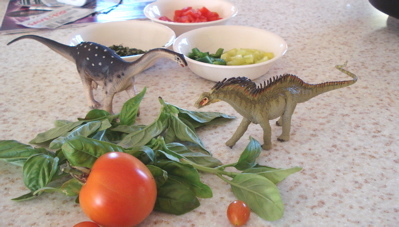 What Battat added to the Dinosaur toys was dynamic action. The (most desirable of them all) Diplodocus (left) is seen standing on its hind legs, rearing up as if reaching for the tender leaves in the tops of trees. Whether the Diplodocus did this in fact or not... it made for a fabulous and what has become iconic, figure. It also set the tone for future figures from all the manufacturers. Not to be outdone (right) Safari, Ltd. came out with their own Apatosaurus standing upright on its hind legs, if significantly smaller. What is most amazing to me is that of all the Dinosaurs to find themselves in such dynamic, active poses, for the plodding Sauropods to be the ones to get the honor is truly surprising. Today almost every new figure is created in a uniquely active pose. This doesn't always make for great play-ability however. A Dinosaur always looking over its shoulder isn't watching where its going. Sauropods had more sense than that. such as the Invicta Cetiosaurus (above) on various internet venues.